Should I Buy the MU-X or Colorado 7 - UPDATE — Auto Expert by John Cadogan - save thousands on your next new car! See the original post, for context. In the original Holden Colorado 7 versus Isuzu MU-X post I recommended the potential buyer, Trevor, look at the Kia Sorento/Hyundai Santa Fe instead of either, and I also dismissed the Isuzu MU-X as a comparative dog (compared with the Holden Colorado 7) because its drivetrain didn't measure up. I said it made less torque and also had one less forward speed in the auto transmission. Two commenters weighed in: Simon Ireland and a bloke named Dazz. You can see their unedited comments in the original post. Their objections are summarised below. Claims MU-X produces most of its torque across a very wide range of RPM, removing the need for a six-speed transmission. Says Colorado 7's narrow torque band absolutely needs the extra gear so it can keep in that range. Claims the South Korean pair will have better road manners for ordinary driving but wouldn't measure up for long-term owing. Says the MU-X will win at towing over the Korean pair. 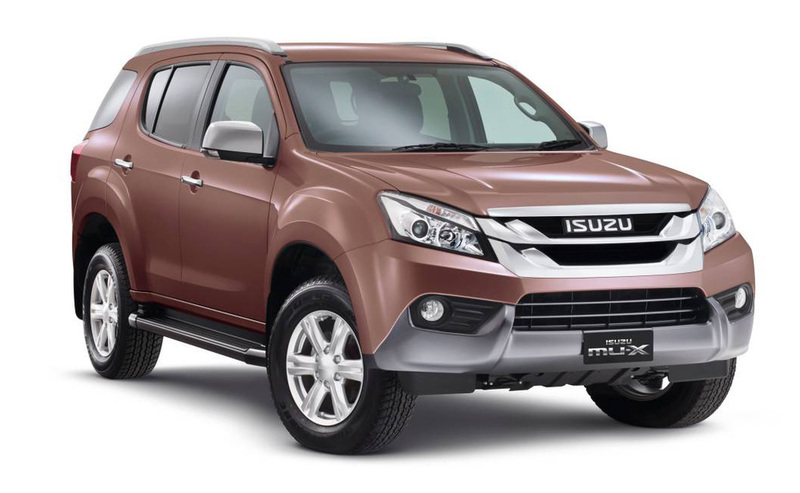 Says Isuzu MU-X delivers more torque across more of the rev range (flat torque curve)? Says this is superior. In principle, torque delivery over the normal driving rev range is very important. I actually considered that in my response to Trevor - but time is limited and you can go to a virtually infinite depth of explanation on everything. The reality is that the Holden Colorado 2.8-litre diesel auto (the powertrain we're discussing) delivers more torque at all normal driving revs. From 1200rpm to 4000rpm - normal driving revs for a modern diesel - the Holden Colorado 7 just blows the Isuzu into the water, then lifts it out, dries it off and burns it. The torque curves are both freely available online on the Holden and Isuzu websites. Both this graph and the Isuzu one below use the blue line to depict torque and the red line for power. Both use Newton-metres for torque, however the Holden one has the Nm scale on the left, while the Isuzu has it on the right. Kilowatts (power units) aren't given on the right-hand axis for the Holden, but they're on the left on the Isuzu chart. The graphs are so monumentally different, at-a-glance comparisons are very difficult. Above: Holden Colorado 7 torque curve. Source: Official Holden website. The first thing you notice about the Isuzu is the vastly different proportions and scaling of the axes. Kilowatts (on the left) is grossly exaggerated, compared with the Holden graph. Also, the proportions of the graph are vastly different: The Holden graph is low and wide, the Isuzu curve is tall and thin. How anyone can make valid observations between the two, at a glance, is beyond me. To present an easier comparison, I graphed both torque curves on the same set of axes. I scaled off the numbers at convenient intervals and built a graph of the two (the values I used are presented below). OK - so, above, the left-to-right space is engine RPM, with 1000rpm on the left, and 4000rpm on the right. That's the normal engine operation range for each diesel engine for ordinary driving - dominated by the 1500rpm-3000rpm range. The vertical axis on the left starts at 250Nm at the bottom and finishes at 500Nm on the top. The Isuzu torque curve is the bottom one, in red. The Holden Colorado 7 torque curve is on top, in blue. The grey area in between the curves represents the torque that the Holden Colorado 7 delivers, which the Isuzu MU-X does not. There is a massive difference at the most critical rev ranges, with Holden significantly in front. As you can see, there is a major deficit between the Isuzu MU-X and the Holden Colorado 7 - especially in the vital rev range between 1500rpm and 3000rpm. The Isuzu MU-X is a massive 33 per cent under-done at 2000rpm. The Holden Colorado 7 is a much stronger performer than the Isuzu MU-X - especially in the critical 1500rpm to 3000rpm rev range, where the overwhelming majority of real-world driving occurs. The flat peak on the MU-X's torque curve (from 1800rpm to 2750rpm, where it delivers its rated maximum of 380Nm screams 'software-limited'. As in, the engineers have limited the fuel delivered to the engine in this range to keep the torque at 380Nm. The usual reason engineers do this is because there is a component (or components) in the drivetrain that are not rated to exceed 380Nm. In other words, the transfer case, the transmission or some other expensive part that cannot be modified and remain within the R&D budget, is not rated by Isuzu (internally) to withstand more than 380Nm - it's the only reason the torque curve can be flat like that. It's an artificial limitation, usually imposed to protect a component that is the 'weak link' in the drivetrain. The MU-X does have the dog of a drivetrain, comparatively. In most other respects, the vehicles are identical - even on price - so why on earth would you buy the one (Isuzu) that delivered massively less torque across all normal driving revs, and which also had one less forward ratio in the auto transmission? Doing that would be crazy. And, advice-wise, I don't do 'crazy'. So, when Simon Ireland and Dazz in the comments section say the MU-X produces most of its torque across a very wide range of RPM, removing the need for a six-speed transmission, and out-points the Colorado 7, it's pretty clear they never actually investigated the real numbers, and believe what they believe for a reason other than the cold, hard facts. Who knows - maybe they really like Isuzu. Nothing wrong with that, until you start inventing a convenient reality to back up your position, which doesn't measure up to the truth. Uninformed comment is easy to make. When Simon said the South Korean pair will have better road manners for ordinary driving but wouldn't measure up for long-term owing, you'd have to discount this claim as well. Trevor, the bloke who posed the question as to which vehicle he should buy, was successfully towing the van with an ageing Kia Sorento. Presuming this meant the previous model, that vehicle apparently did the job for Trevor (ie, it measured up for long-term towing throughout its life). The new model Sorento would be better - principally because its engine outputs are 16 per cent more in the power department (145kW at 3800rpm for the new one versus 125 at 3800rpm for the predecessor) and 11 per cent more in the torque department (436Nm from 1800-2500rpm for the new one and 392Nm for the predecessor). Sorry, Simon and Dazz. I appreciate you taking an interest in the website, and taking the time to offer your advice. I'm not having a shot at you. However, buying a car is an expensive undertaking and I'm obliged to repudiate your points if they look like leading Trevor up the garden path. Unfortunately in this case the boat you are trying to float does not hold water. I'm thinking 'Titanic'. Should I Buy the Mazda or the Audi? How do I Sell a VW Polo Lemon?